Pattern Match is an engaging pattern matching exercise for kids. It is designed to enable children to learn and grasp the concepts of patterns and sequencing in a fun way. In this simple exercise, kids study the given pattern and identify the missing shape or symbol, to complete the sequence. This exercise will help to lay the foundation for logical thinking as well as teach kids the names of some basic colors, shapes and symbols. It will help to reinforce the child’s understanding of the basic concepts of maths. I wanted Medha to do some pattern making activities hence I thought of creating some pattern cards myself instead of buying. I was thinking which would be good to start with pattern make. 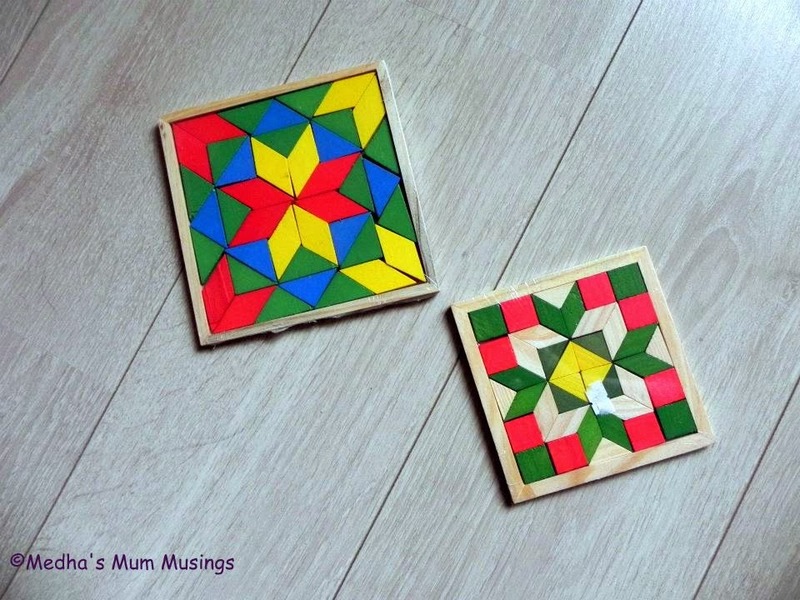 Then I remembered the wooden shapes pieces puzzle bought recently. I decided to start with Big one out of the two and quickly got the chart papers and created some patterns by using pencil and color sketches. I first traced out the shape of wooden piece and colored it with matching color. Here is a glimpse of pattern strips I created. I got time to create only few. There is another reason too for less number of patterns, I was not sure if Medha likes it if it is on a chart paper instead of a card and less neat than the bought ones. If you have older kid who does coloring without mess, you can ask your kid itself to color the pattern shapes. Later, I handed over these strips to Medha along with the wooden pieces and asked her to create the pattern drawn on the strip. She loves matching a lot may be because of the reason I introduced matching cards, puzzles etc. right from her early age and gave different varieties of it every other day to her. She sat down to work it on these pattern making strips and I made her prompting the shape of wooden piece while making the pattern. I created some simple patterns which are having only 2 pieces and also created some with more than 3. Actually, I read somewhere that in montessori education curriculum, they do give pattern card to kid and kid have to replicate the pattern on their tray. How many times I asked Medha not to create the pattern by placing wooden pieces over the pattern, there is no use. She wanted to match the pattern she does with the one on the paper. Here is the final picture of patterns made by Medha yesterday. She had done this activity so many times from past 3 months. (Yes, I created these 3 months back in August) But I didn't get a chance to take pictures while she is doing this activity. By god's grace, I got chance yesterday and clicked all these snaps. Hope you will also create something similar appropriate for your child's and try out with your kids. Do share your ideas if you have tried anything so. :) You can create these kind of patterns by using the available items in your house, example: buttons, beads, blocks, LEGO bricks puzzles etc.